Rio de Janeiro is a perfect location to drink beer. Cooled down to just before the freezing, the Cariocas love Skol, Brahma, Antarctica (all belong to InBev, the largest brewer in the world) or Itaipava. These everyday beers are ok (as long as they served no warmer than 3 degrees cold), but they are in the long run a steady source of longing for authentic flavors. In Rio's supermarkets it is no problem to find a more or less large selection of imported beers, but the prices are much more expensive than it used to be at home. Not only German wheat beers are very popular, you also get expensive beers - even original Trappist beer from Belgium. After some time, the immigrant beer friend makes a surprising discovery: There are also very good Brazilian beers! In this section of my website, it should not be just about the Brazilian "gourmet" beers, but also about the comercial local beers, which differ in taste. The list of beers is continually expanding. This ranking is not an objective assessment of the listed beers. The illustrated ranking corresponds merely my subjective judgment and makes no claim to universality. Full banana flavor. Fresh, lively and super tasty! Can compete with the best German products. Champagne-like beer miracle. Unique, incomparable fragrance. Very bright appearance. Very, very mild, yet a true pilsner! Soft and spicy. Incredibly mild and round. Pleasing harmony. Gourmet beer! Smells like coffee, tastes like coffee - but it is beer. Unbelievable! You can't taste any alcohol. A work of art. Excellent! You can't taste alcohol, you can't smell it. Clears the nose. Excessive note of bitterness. A masterpiece for the later evening. A beer for old sailors! Naturally cloudy golden ale. Lively, very persistent carbonation. Sour, malty aroma of coffee. Harmonious body. Strong alcohol not noticeable. Golden dark, sweet and spicy beer. Smells like spring. Fruity, fresh aroma. An experience! The miracle of this beer is its beguiling sweetness - while avoiding any penetrance in this direction. Although there seems to be no bitterness, we know that we're dealing with a real beer anyway! A miracle! Very light, refreshing beer with black soul. In the finish with pleasant acidity of coffee. Excellent dark beer, proving that dark beer taste like dark beer, even if it is not so sweet. Malty fresh beer. Mild, lingering aftertaste of country (Minas Gerais!) and cereals. True pilsner feel neither too acidic nor too sweet, nice foam, bright color. Very fresh, tasty beer! Cloudy, light beer. Only for special moments! Smells like orange juice, looks like an "Altbier" and tastes as well like it. Amber to honey. Brewed according to the German Purity Law. Very little foam. Mild, true black beer. Malty modesty, pleasant finish, exceptable sweetness. Smells chocolaty. Malty finish. Delicious dark beer! Very acidic single-malt. Beautiful foam. Strong alcohol breaks through. Strong, spicy appeal for such an easy black beer. Somewhat watery finish. Much less sweetness than competing beers. Absolute surprise in the low price segment. Real beer, hoppy - without interference. Light, true pilsner. No astray by too sweet or too sour. Optimal sailing beer, very light appearance. Sour, strong citrus-like aroma. Very mild lager, almost no foam. Aqueous, but real beer. A light version of Bavaria? Ok for the beach. Little foam, very light. Mild beer with true intention. Fresh, very slight astringency, but with an echo of dominant acid, unfortunately. Established beer. 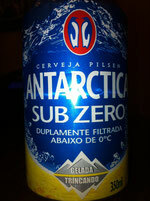 https://www.facebook.com/Antarcticahttp://www.ambev.com.br/pt-br/nossas-marcas/cervejas? This beer wants to be something: very mild bitterness, but - like all everyday beers to strong acid. An indecisive beer without metallic chemical irritation. Ambitious beer - brewed according to the German Purity Law. Unfortunately, a bit musty and discordant. Fresh smell of hay. Beautiful foaming. 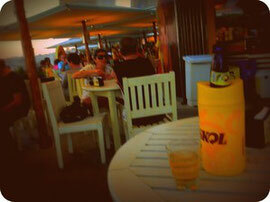 For a premium "Puro Malte" the taste is too sober. Somehow unbalanced. Aqueous tartness, very mild beer. Malty aftertaste. Very bright almost white beer. Undecided taste. Synthetically bitter. Energetic elusiveness in taste. Acidic to dry with no apparent dominance. Metallic, chemical aftertaste. This beer starts in taste amazing herb. Shortly before to feel a real pilsner you are confused by cake-like flavors on the finish. Pils and tea party do not go together! Sour beer with chemical, light tartness. In the aftertaste metallic. Very pale brew. Double filtering (below 0 degrees) seems to bring no benefit. Chemical taste. Undefinable chemical score, tastes like tires. Promising white bottle, promising color (amber), but even the fast-dissolving foam is a disappointment. Smell like wheat beer, banana. Taste elusive, somehow bitter in the background, clove dominant, but disappointing in every case. No soul! Promising sour smell, total disappointment in taste: watery sadness, bitterness in the far background, with Bock beer nothing in common. Sweet, alcoholic drink. Licorice with penetrating exaggeration of sweetness. Sour smell. Not even tastes like beer. Sour-irritating chemical grade.